ON TOUR: Where is La Rioja? Travellers used to Accor’s Etap and All Seasons budget brands can now forget the confusing names. The multi-national French hotelier is dumping the trading titles in favour of the much better known ibis signature. Ibis, remains ‘ibis’. 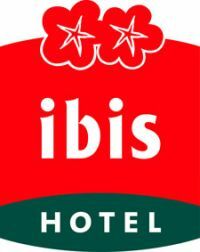 Etap Hotels becomes ‘ibis budget’. All Seasons is renamed ‘ibis styles’. The implementation of what Accor calls “this new segmentation” will be completed worldwide by early 2013. A plan to modernise all the hotels and improve bedding comfort will be implemented in what are essentially economy brands. Accor says that it will now also promote its own name much more than in the past with the new tagline “Open New Frontiers in Hospitality” reflecting the group’s aspirations. Accor, and its visibility, is considered vital in the internet battlefield, which is crucial to the future of the hotel business, and with the loyalty programme A|Club renamed Le Club Accorhotels. 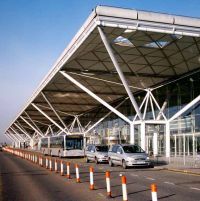 Stansted Airport, or for that matter either of Edinburgh or Glasgow, are not likely to be sold off by BAA Ltd in the very near future. The Spanish-owned company has decided to now seek a judicial review of the Competition Commission’s judgment forcing it to sell two of the three airports. It was back in 2009 that the Commission decided that the airports required to be sold (plus Gatwick which BAA pre-empted). Legal machinations continued and in November last year the Commission was forced to re-open the case on the grounds that circumstances had changed. That was ruled not the case. 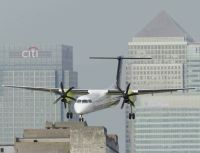 Air France/KLM’s subsidiary CityJet held a briefing in London last week to introduce a high profile re-launch of the carrier, the first since the takeover in 2009 of fellow London City Airport operator, Dutch carrier VLM. CityJet, with its Air France ownership and background has the distinction of being the airport’s longest established operator, a partner of Brymon Airways when it established London City’s first route in November 1987. Over the next five weeks the airline is undertaking £1m pan-European multi-platform brand building above-the-line marketing campaign that includes outdoor, print, broadcast and online creative executions focusing primarily on the London region but also across the Benelux countries, Ireland (Dublin) and Scotland (Edinburgh and Dundee). 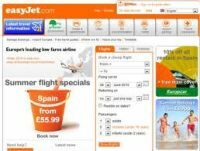 Luton-based easyJet has launched its summer 2012 schedule with a choice of more than 300 destinations. More than 110,000 flights are now on sale to destinations throughout Europe, the Middle East and North Africa. According to easyJet (and its booking systems) the British summer runs from 25 March through to 2 September 2012. For those who want to escape the London Olympics now is the time to choose the cheapest flight. 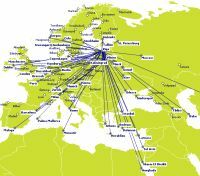 Capacity has been added to popular leisure and business destinations including Barcelona, Alicante, Madrid and Rome. Peak summer seats for easyJet’s newest base, Southend Airport, will also go on sale for the first time with a choice of eight destinations: Amsterdam, Alicante, Barcelona, Belfast, Faro, Ibiza, Malaga and Mallorca. Hard on the heals of its Dubai introduction (AERBT 12 September) IndiGo has taken advantage of winning approval for international flights by commencing services into Changi Airport, Singapore from Delhi. IndiGo is the fifth Indian carrier to operate at Changi. IndiGo now operates daily, flying a 180-passenger Airbus A320 aircraft in a single class configuration. It will add a Mumbai – Singapore service commencing in the middle of October. IndiGo uses Changi Airport Terminal 2. With the addition of IndiGo, the Singapore – New Delhi route will be served by four carriers operating a total of 70 flights a week. On Singapore – Mumbai no less than six carriers offer 90 flights a week. Ever resourceful, and in constant battle with the legislators and the Office of Fair Trading in particular, Ryanair has come up with its latest wheeze to extract money out of air travellers. Living up to its reputation as the world’s most annoying airline clients are now being invited to take a “Ryanair Cash Passport”, another piece of plastic promoted as a way of avoiding the £6 surcharge (admin fee) that passengers booking via a debit, credit, or Visa Electron are charged by the airline per one-way flight. 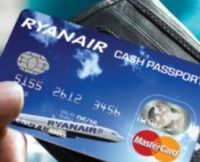 The problem with the “Ryanair Cash Passport” is that you have to load the card with cash before you can use, in other words Ryanair and its banker (Access Prepaid Worldwide, a division of MasterCard) gets the loan of your money interest free. Other prepaid cards are out in the marketplace including MasterCard itself. However after 1 November Ryanair will not accept them. Only about 5% of the UK population is believed to use prepaid cards. Henry Sotheran’s, famous for fine books and dating back to 1761, is mounting a vintage travel poster exhibition which runs until 1 October at its Sackville Street, Piccadilly, London premises. Even if you are not interested in purchasing any of the original lithographs, which are priced up to nearly £10,000, it is well worthwhile spending time viewing some extraordinary works of art. BOAC finds favour with the gallery, as does Cunard and any number of popular international destinations. 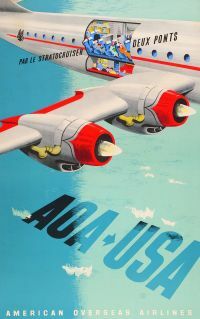 A zebra advertisement for Africa by TWA must be a classic, and Air France, American Airlines, BEA and Swissair did commission in their time some glorious posters. Artists working for London Transport, as was, were clearly directed to help with Keeping Britain Tidy. “Don’t Drop Litter” ran the advertisement. Whether Airbus and Boeing are pleased with the orders, each for 25 Boeing 787 Dreamliners and 25 Airbus A350s, is arguable. Normally commitments of that size produce great fanfairs. This time around the mood is more subdued. Air France is said to be more politically sensitive to where it buys its aircraft than most. Rumours were that management wanted to go for the Boeing. The airlines operate very successfully 60 Boeing 777s, but in recent times no 737 series aircraft at all. 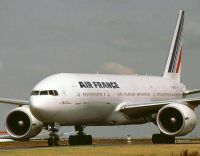 Air France has had its differences with Airbus over what caused the 2009 mid-Atlantic crash of an Airbus jet. Was it the aircraft, pilots, or a combination of both? 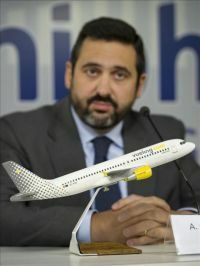 Vueling, which calls itself “the new generation Spanish airline” and also boasts of being the only budget carrier into Heathrow, is to increase the frequency of its flights to the port of Bilbao in northern Spain. From 30 October the schedule will feature twice daily services, doubling the airline’s capacity to the Spanish destination. The increased frequency follows a successful seven years of service between London and Bilbao. “We are responding to increased demand from passengers in both the leisure and business markets. The new schedule enables business executives to make convenient day return trips, and leisure visitors can enjoy comfortable long weekend breaks,” said Alex Cruz, CEO of Vueling. Skyscanner, the Edinburgh-based leisure fare flight comparison operator and booking search engine, have come up with a most interesting schedule of "plastic money” reservation charges. Offering comparisons for both debit and credit card, 17 airlines feature on the list. It must be emphasised even as we go to press the costs are changing in what is a very competitive business segment. 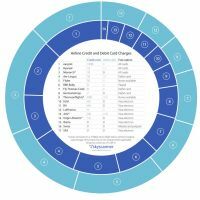 The evaluation is based on return costs as some airlines like to charge per actual flight, others per person, or as a percentage of the total flight charges. 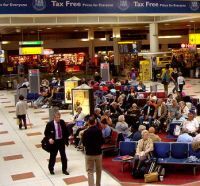 Passenger numbers have taken an upward turn at Gatwick Airport together with record average load factors. The August figures, just published, show an increase of 132,500, year-on-year, an increase of 3.6%. With long haul carriers Air Asia and Vietnam Airlines due to start operations in the coming months and the possibly of Hong Kong Airlines arriving next March (see in this issue) the mid-term outlook for the airport looks promising. Average load factors rose 1.4 percentage points to 88.4% this month compared to the same month last year – resulting in Gatwick's highest ever average load factors. 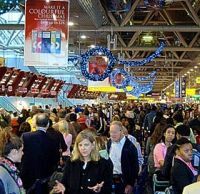 The school summer holidays saw year-on-year growth with around half a million passengers travelling through Gatwick over the August bank holiday weekend. The most popular destinations being Malaga, Palma de Mallorca and Dalaman. Overall capacity was up by 86,000 seats with growth to a wide range of Spanish, Italian, Swedish and Canadian destinations. Air transport movements grew 2.1% with short haul markets seeing the greatest gains. Manchester could be the next UK destination for the family-owned Spanish hotel group which is also in the process of rebranding. Whilst the company is reticent regarding details it is said to be close to exchanging contracts for a 5-star property in central Manchester which would then be completely remodelled. The 270-room Drurys Inn does fit the bill. Presently in the UK, Melia own and operate the luxury White House hotel near London’s Regent Park, and is busy completing the prestigious ME Hotel, on the former Marconi House site in The Aldwych, which was damaged by fire in June (AERBT 20 June). This is delayed but will open in time for the Olympics. Gabriel Escarrer, Chief Executive Officer, unveiled the new corporate name last week and using the opportunity of a London press conference of a new Strategic Plan for the period 2012-2014 with a clear focus on globalisation. Based at the Swiss capital of Bern, SkyWork Airlines, an independently-owned regional carrier, has introduced flights to Rome and Vienna. At the same time and just five months after its debut, the airline has upped frequencies from London City to Bern from six to 11 flights weekly. The Bern to Rome service operates Monday to Friday with departures from Bern leaving 10:10 and arriving Rome 11:45. The return Rome service departs 12:25 arriving back in at 14:05. With Vienna the operation is daily (except Sundays) leaving Bern 15:40 arriving in Vienna 17:15 with the return 17:55/19:30. With these new additions, SkyWork now links the Swiss capital to a total of ten destinations. A further four – including Amsterdam, Belgrade, Budapest and Madrid – come on line at the end of October. At London City the new schedule gives morning and evening return trips Monday to Friday. Also on offer are Saturday morning and Sunday evening roundtrips. The region of Rioja, in North East Spain and south of Bilbao, is renowned for its long heritage of wine production which began when the Roman’s introduced the vines back in the first century. 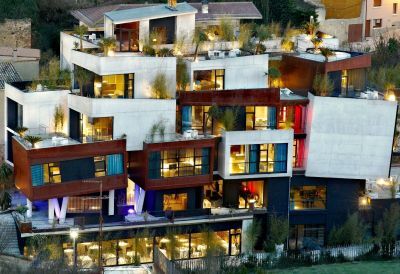 However, a quiet revolution has recently taken place as modern architectural structures featuring striking designs have become as prevalent and potent as the region’s full bodied reds. Canadian architect Frank O. Gehry put Rioja on the map with his sophisticated design at the Marqués de Riscal Bodega. Others have added to the landscape with elite Valencian architect Santiago Calatrava Valls designing the beguiling Ysios which, with its undulating structure, reflects its Cantabrian mountain range backdrop; J. Marino Pascual’s Bodega Antion replicates a carefully balanced set of children’s building blocks. Hotel Viura, located in the medieval village of Villabuena, population 300, (vineyards 43!) epitomises the pattern of constructing elaborate edifices that should radically conflict with the surroundings. Yet careful design, attention to detail and considered thought ensure the avant-garde properties of Rioja actually complement and add to the beauty of the local scenery. From Bilbao’s airport it is around 70 picturesque twisty miles. Depending on your driving about 90 minutes. Opened in Spring 2010, Hotel Viura has quickly become one of the region’s iconic boutique hotels. Designed by a young woman from the diminutive village, the impossible building which blends industrial techniques with style and comfort, consists of seemingly precariously balanced cubes bursting animatedly from the ground. On careful viewing much is actually optical illusion with carefully angled window frames, columns and supports belying the solid structure beneath. Each of the 26 rooms and seven suites have an individual identity but feature a collection of style elements most down-town Manhattan hotels would be proud of. Coloured glass partitions, polished concrete, refurbished industrial wood all combine to create comfortable, bright and airy rooms. Seemingly randomly scribbled chalk numbers indicate the rooms, and idly doodled chalk images entice you to get up close and personal with the industrial design. 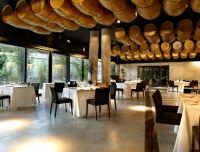 The restaurant’s barrel ceiling leaves nobody in doubt about the regional location and as Pedro, the Maitre D, leads guests through the extensive restaurant wine list the call of the vines can be heard. Haro is the central focus of the region’s wine production. This focal centre is home to the traditional Compañía Vinícola del Norte de Espaná, or CUNE as it is better known, owned by the Asua family since its inception in 1879. It is the byword for innovation in wine production and responsible for producing the rich reds such as Imperial Gran Reserva, Cune Reserva and the more coiffable white Monopol which is the oldest white wine of the region and made from 100% Viura (after which the hotel is named). Cune produces a mammoth 9 million bottles of wine per year and is listed on the Spanish Stock Exchange. It has always been at the forefront of wine production and first demonstrated its radical approach by employing the architectural office of Alexandre Gustave-Eiffel, just 20 years after opening, to design a new type of wine cellar. A form of structural support consisting of metallic trusses extending from wall to wall negated the need for columns in the vast barrel room. 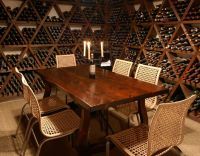 This created a more cost efficient space in which to store, rack, maintain and supervise the wine barrels. Later in 1941 CUNE became the first vineyard to use epoxy lined concrete vats in which to store its wine, a technique which was quickly adopted, then abandoned for stainless steel. However the concrete vaults are now undergoing a renaissance across the region as the qualities of high neutrality and stable temperatures produce a superb wine making environment. Five generations later the Asua family continues to innovate and the latest addition to their radical wine production has been the construction of the Viña Real vineyard where 3m of the Cune's bottles are produced annually. In contrast to the traditional hacienda style of Cune Viña Real’s architect Phillippe Mazières, who also designed the winged structure of Bilbao airport, has created both a beautiful and functional homage to wine production. The unusually light main building is inspired by the allegory of the wine making process. 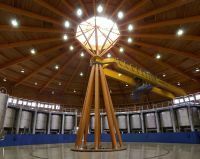 Mazières took the key ingredients of wine production – wood, glass, stainless steel and concrete – and created a monolithic structure that represents an oak wine vat, but made of red cedar wood. The cylindrical two-storey structure, which is supported by an a frame of lengthy pine wood columns, creates wine through an intriguing gravitational method which sees the grape always journeying downwards through the process. The main “vat” building is then linked to two tunnels bored deep into the hill by the machines responsible for the Bilbao subway, and it is here in these enormous underground caverns that the wine finishes fermenting. It is said that 1964 is the harvest of the century in Rioja, closely followed by 2001 so for any serious investor look out for the illusive Imperial Gran Reserva 1964, but you will need to be quick. The economic crisis has driven much domestic tourism and the Spanish enjoy drinking their own wine. For those that come from further afield Alava Incoming specialise in arranging cultural, gastronomic and tourist itineraries in the province. 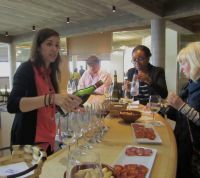 Vineyard tours can be as simple as a tour and tasting for €8, or include a full five-course Spanish meal, with of course accompanying wines for around €35. Harvest time, when the burnt umbers, brilliant reds and ochre yellows of the vine leaves paint a pallet on the landscape, is the best season to visit. Alava can arrange for budding oenologists to become part of the harvest workforce. Boeing, which should this week be warming up to the ceremonial handover and first delivery of the 787 Dreamliner to ANA next weekend, is now facing up to problems regarding Cargolux receiving its first 747-8 Freighter which was due today (19 September). This has been cancelled, the plane manufacture citing "unresolved issues" with the airline. 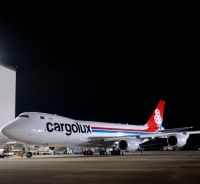 Boeing spokesman Jim Proulx said the company was working with Cargolux to resolve the issues. 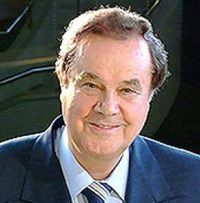 He declined to say how the snag would affect the 747-8F delivery schedule, with a second aircraft due imminently. In spite of serious financial problems, and the cancellation of some services, Latvian airline airBaltic is continuing with its operations. In a strongly worded statement last Friday, the Latvian government said that it would continue support for the embattled carrier. 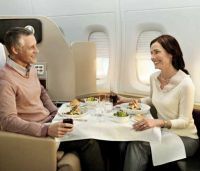 From next year customers on British Airways Heathrow to Moscow flights will be able to sample the airline’s award-winning services in First and Club World business class . British Airways has three return flights to Moscow’s very modern Domodedevo Airport per day. From April 2012, this route will change from a short haul service operated with two cabins to a long haul operation offering customers up to four classes of travel. This means customers will have the opportunity to enjoy the airline’s fully flat-beds, comprehensive in-flight entertainment and sample a wide selection of meals and drinks. Icelandair will begin year-round, non-stop services from Denver (DIA) to Reykjavik in May 2012. Via Reykjavik this will give connections to what is known as the Mile High City four times per week from Heathrow, and from Glasgow and Manchester too. From Denver, eastbound, the Boeing 757 flights will offer one-stop services to more than 20 destinations in Europe including Amsterdam, Copenhagen, Munich and Paris. Denver is the ninth North American city to be served by Icelandair. Europe ranks as Denver’s largest international market, accounting for one-third of DIA’s international origination and destination travel. Even with daily flights to London (British Airways) and Frankfurt (Lufthansa Airlines), Denver has been underserved in transatlantic access. London is expected to be the next international destination for Hong Kong Airlines with Gatwick as the probable gateway. 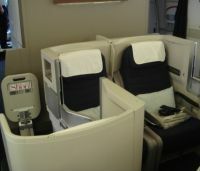 A Business Class only Airbus A330 would be used for the operation starting next March. The route was attempted by Oasis Airlines but failed in 2008. It was said that the carrier was under-funded and the cabin mix was wrong. Four attempts to operate Business Class airlines have been attempted in fairly recent times on the north Atlantic and with the exception of L'Avion, bailed out by BA, they have collapsed (Eos Airlines, Maxjet, SilverJet). The difference with Hong Kong Airways is that it already is a full IATA member and backed by Hainan Airlines, the fourth largest Chinese carrier and is privately owned. With British Airways seriously revising its operation to Australia (see AERBT 29 August), oneworld partner Qantas has reorganized its services to ‘Down Under’ focussing on Singapore as the direct gateway to Oz. From the start of the 2012 summer season at the end of March the airline will operate two of its much praised A380 services daily from Heathrow non-stop to Singapore, one aircraft going on to Sydney and the other to Melbourne. QF limits its A380s to only 450 passengers with Business Class and Premium Economy on the upper deck and First Class plus Economy on the main deck. Currently there are ten A380s in service with another two to be added by the end of the year. The UK government's Department for Transport (DfT) has published a 168 page updated version of its 2009 aviation forecast that proved wildly optimistic. Two years ago the DfT was saying 455m passengers for 2030. The revised figure is now 335m. In 2010 221m people moved through the UK’s 40 significant scheduled service airports. A government statement coinciding with the report sets out a number of options for reducing the carbon footprint of aviation, including not building runways in the UK between now and 2050. Quite where the DfT expects all the extra passengers to fly from remains much of a mystery although the increase of Airbus A380 activity, and the withdrawal of smaller less efficient aircraft at the major airports will see a significant increase of passengers' movements per departure/arrival in the years to come. The figures in the report regarding civil aviation's contribution to greenhouse gases is regarded by many experts to be questionable. No consideration seems to have been made regarding military air traffic.